I like to follow the MotoGP. MotoGP involves riding incredibly powerful motorbikes around a track at extremely high speeds in very precise racing lines in close proximity to other bikes. It takes a hell of a lot of skill and no small amount of luck. Sometimes it goes wrong, as in the recent accident when Marco Simoncelli died following a collision during the race. Is racing fun? Definitely. Is it dangerous? Hell yes! Why, then, do they do it? Simple. Because they want to. Most people are aware of the risks, but nearly everyone will sill travel by road and by air. I think that is for two reasons. Firstly, the actual chances of an individual being in an accident are pretty small. Secondly, we make a trade off – we all take risks everyday, either for convenience or for fun. Those risks extend to most aspects of life, and yet I think road safety is subject to far more campaigning and legislation than most things. I think making the roads safer for us all is very important and I am grateful for all the additions that help with that – seatbelts, airbags, ABS brakes, MOTs, and thousands of other improvements. I think that the campaigning goes too far though. For one thing, I think that the effect of speed on accident rates is exaggerated by safety campaigners. When there are accidents that could have been avoided I believe that the problem is usually not speed, but other failings of the driver like following other vehicles too closely, not concentrating on the road or looking before manoeuvring, or misjudging weather conditions. Safety campaigners argue that the national speed limit should not be raised from 70mph to 80mph because it would cause more accidents, but would it really? I suspect that actually it will make no difference and I think that unless the speed limit were reduced down to 30 or 40mph then the severity of accidents wouldn’t change either. We should not forget that when motorways were first introduced they had no speed limit. There were many accidents, however those accidents for the most part were not caused by inability to control a car at speed, but the inability of the cars to maintain those speeds without falling apart or exploding. Cars then were rickety, had few safety features, and many unsafe design decisions, and their engines and parts could not deal with high speed travel without overheating or wearing out. In addition cars in much poorer condition were allowed on the road. 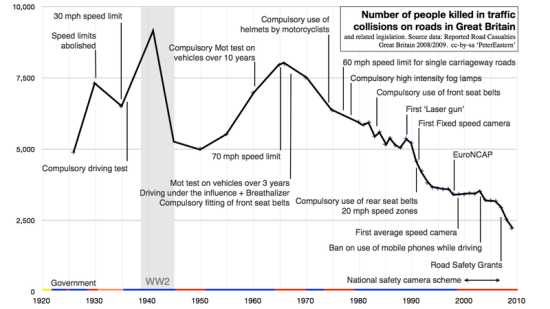 Modern safety features and MOT checks have changed all that and cars are far safer and more capable now and so I believe the 70mph speed limit to no longer be necessary. Many bikers are increasingly worried about new and proposed regulations affecting motorbikes and especially regulations coming from the EU. Motorcycle Action Group (MAG) and other groups have even staged protests against many of these laws which would mandate taking away absolute control of the throttle and ban home maintenance or making changes to parts of the bike, among other things. There are even some who are calling for an outright ban on motorbikes. I believe this to be absurd, and not just because I ride a motorbike myself. When riding, people again make a choice between risk and convenience or enjoyment. These rules would remove that choice from people. A great many people ride motorbikes for enjoyment, but most also ride motorbikes because bikes and scooters are the cheapest and simplest way for many people to get around. These changes would destroy that advantage and make motorbikes costly and complex. I think the arguments against raising speed limits for safety reasons are null and void. If the rise is unsafe, and if motorbikes are unsafe, then so are cars. Where does it end? The only logical conclusion is to ban road travel. And then ban kitchen knives and hot cooker hobs. And ban lawnmowers. And… well, you can see where I am going. We always take some risks just to get on with our lives, and we make choices about the amount of risk and the trade-off made. Finally, I should point out that many people are against a speed limit increase for environmental reasons. That’s fine, but you should note that it is a separate issue from speed, and that it also rules out speed increases that are more environmentally friendly. If an electric car were charged by wind-power, why shouldn’t it travel at 80mph? And so I’m in favour of increasing the speed limit. Actually, I’m in favour of abolishing speed limits on motorways altogether. It works for Germany. All of the above is my own opinion and is changeable subject to rational arguments or actual research and statistics. This report was shown this evening on Channel 4 news and shows the problems with the Work Capability Assessment and the appeals process for Employment Support Allowance. Skip to 8:50 for the interview with Chris Grayling. This is the official Channel 4 video and is the same as the one above but it does not have the interview with Chris Grayling. A report not only says that an independant board should be responsible for signing people off work, but also that people who are signed off should go on Job Seekers Allowance and look for work. I’ve written a response in Sick? No you’re not! Justice Secretary Ken Clarke says he is close to reaching a deal which would allow British judges to overrule European human rights legislation. Human rights legislation appears to be the only thing holding the Tories back. This is bad. Things aren’t going well in Egypt either. The military are still in control despite promises of elections, and they don’t like protests so much now. 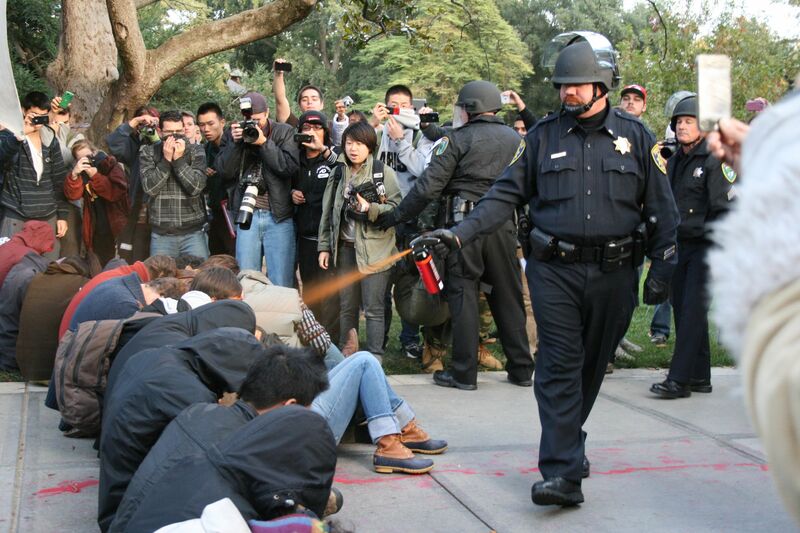 Then there is this video of police using pepper spray on seated, compliant protesters at UC Davis in California. And I have a flu jab in two hours time. After looking at AMD’s new APUs combining CPU and GPU recently I asked the question “What is the point of integrating the GPU with the CPU when having the GPU in the motherboard chipset does just as well?” I had a couple of suggestions, including that it moved the GPU (a big heat source) under the main heatsink which might allow for better cooling. Now I have had a think about it some more and have realised a couple of other things. Now that the memory controller is built in to most CPUs, moving the GPU in there too might allow faster and lower-latency memory access. Although probably still slower than having a dedicated GPU with GDDR5 RAM, the latency to access raw data from main memory will be improved. More importantly, however, is the growing trend of offloading number-crunching tasks to the GPU using NVIDA’s CUDA or AMD’s OpenCL. Currently this is limited to software that has specifically been coded to make us of this function. Some high-end video editing effects plugins, video compression, Photoshop plugins, and some large scientific models are about all that make use of this. It looks like more and more things will be converted to make use of the extra power over time. Since using the GPU marks a shift from using the CPU, the CPU could be simplified as these tasks move out. Current CPUs include plenty of Single Instruction Multiple Data (SIMD) instructions that could be replaced by GPU functions. The GPU can take care of both integer and floating point operations, so potentially the FPU could also be done away with. Actually, in AMD’s new FX Bulldozer architecture CPUs there is only one FPU between each pair of CPUs and so I wonder if this is because FPUs are less needed than main cores, or because of an intention to move floating point functions away from the CPU. When you look at everything that can be moved from the CPU to the GPU, integrating the GPU in the heart of the computer suddenly seems like a much more sensible idea. I can envisage a time when CPU and GPU cores come in pairs (or 2 cores per GPU, or whatever the best ratio is) and the CPUs are much simpler devices without SSE SIMD instructions or FPUs. I know that it is AMD’s intention to make an APU combining Bulldozer with a GPU; perhaps we will see a Bulldozer-like design where the FPU in each CPU-pair module is replaced by a GPU. Daily Mail backpedal on DLA attack? On Friday the Daily Mail published a story with a front page headline “DISABLED BENEFIT? JUST FILL IN A FORM”. On Saturday, a story by the same author appeared inside the paper, this time presenting some of the objections to the first story. I’m afraid that I remain rather cynical on this. The piece looks to me like a rather hurried climb-down by the same author that wrote the previous story. The tone of the two pieces is completely different; the first one contains many (incorrect) assertions, while the second one simply quotes various objections from charities but asserts nothing. Indeed, the words “claims” and “said” are all over the place in the article including the headline. The article does make an effort to present the correct data about numbers with evidence and amounts claimed but this is still limited to a tiny paragraph more than halfway through. Then look at the prominence given to the two articles – one was a front-page headline and the other was hidden inside the paper. Ultimately the intention of the writer is betrayed by the choice of final paragraph – a quote from Ian Duncan Smith which again emphasises the lack of checks of permanently disabled recipients of DLA. This emphasis is purely idealogical and in my opinion an absurd stance – checking permanently disabled people so frequently costs a fortune and achieves nothing! My dad isn’t going to re-grow the discs in his spine. Blind people aren’t going to suddenly see. Paralysed people won’t suddenly walk again. Admittedly some people’s health will improve, but for people on DLA that is a rare occurence and could be better served simply by writing to the patients or their GP once a year and asking if their condition has changed. Author LatentexistencePosted on 13th November 2011 13th November 2011 Categories PoliticsTags benefits, cuts, daily mail, disability, dla, hate, politics, welfare, welfare state2 Comments on Daily Mail backpedal on DLA attack? Protest is a right stemming from freedom of speech, assembly and association. The Met are suppressing it. People do not have a right not to see anything upsetting. And most of all, human rights exist in part not to protect the popular opinions, but to protect those that are hated by society and are at risk from them.